J.P. Morgan raised its price target on Nike Inc. to $85 from $81 as the investment firm has grown more convinced that Nike’s momentum in North America is accelerating. Based on its own recent fieldwork, J.P. Morgan raised its North America revenue estimate to 9 percent growth for Nike’s second quarter ended November 30, accelerating on both a one and two-year stack with double-digit DTC driven by digital growth and 8 percent wholesale expansion. For Nike’s third quarter, J.P. Morgan is modeling 10 percent North America top-line growth and then sees the growth in the region moderating to 4 percent in Q4 in the face of tougher comparisons. J.P. Morgan’s 4.5-percent top-line CAGR over the next 3 years for the North America region is in-line with management’s five-year mid-single-digit target algorithm. The differentiation is being supported by accelerated digital growth, which was up 34 percent in constant-currencies over the trailing two quarters, and being driven by growth at Nike.com, the brand’s Snkrs app, Jet.com and Amazon.com. Differentiation at retail is being supported by continued efforts to reduce its exposure to selling in undifferentiated retail marketplaces with a greater focus on places focused on experience and service. In other regions, J.P. Morgan noted that Nike has expressed confidence in significant growth opportunities in Europe in “clear contrast to Puma and Adidas’ recent more downbeat regional commentary.” Nike is looking for market share gains in five key European cities (London, Paris, Berlin, Barcelona and Milan) to account for more than two thirds of Nike’s EMEA growth over the next five years. The investment firm estimates Nike will show 6 percent growth on a constant-currency basis in Q2. 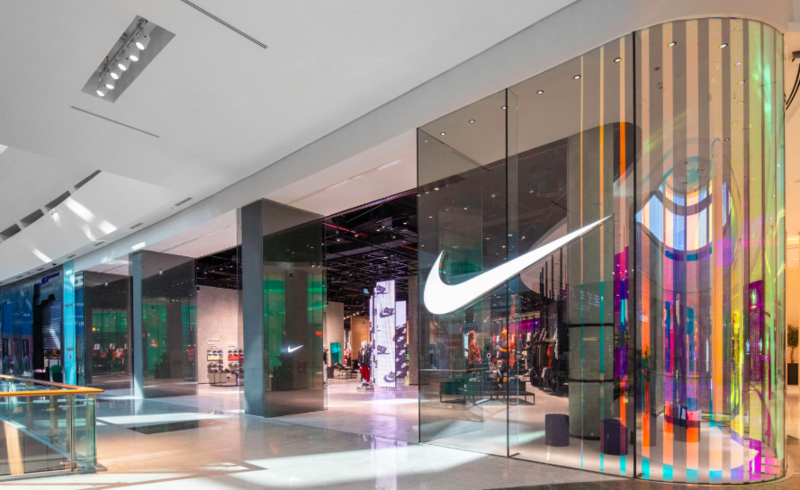 In Greater China, J.P. Morgan said Nike’s management remains bullish on current trends citing no signs of a slowdown to date. NKE ranking as the top-ranked sportswear brand on Singles’ Day (11/11) in retail-sales-value for the second consecutive year is also a sign of momentum in the region. Boss added, “Importantly, management sees NKE as well positioned multi-year to take advantage of the increasing active, middle-class, ‘digitally savvy’ Chinese consumer focused on key cities Beijing & Shanghai.” J.P. Morgan projects 21 percent growth on a constant-currency basis for Greater China in Q2. J.P. Morgan also noted that Nike’s guidance for SG&A dollar growth in-line with sales embeds the reinvestment of NKE’s productivity gains into top-line growth initiatives. Shares of Nike closed Tuesday at $72.69, down $2.76, as the stock market fell sharply on concerns over tariffs. The J.P. Morgan note came out on Monday.